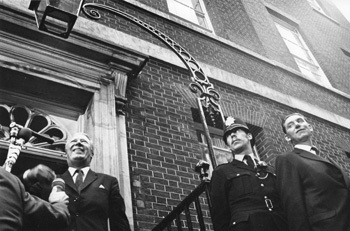 10 Downing Street, June 19, 1970. © Angus Forbes. 1964, October 16: Sir Alec Douglas-Home, UK prime minister, had been defeated by Harold Wilson at yesterday’s general election. Your photographer went to number 10 Downing Street and took pictures of a remarkable event – the ritual departure of the vanquished incumbent. To boos and jeers from the crowd opposite, Home came out the front door, waved cheesily, climbed into the ministerial car and was whisked away for ever. 1970, June 19: Harold Wilson had been defeated by Edward Heath at yesterday’s general election. 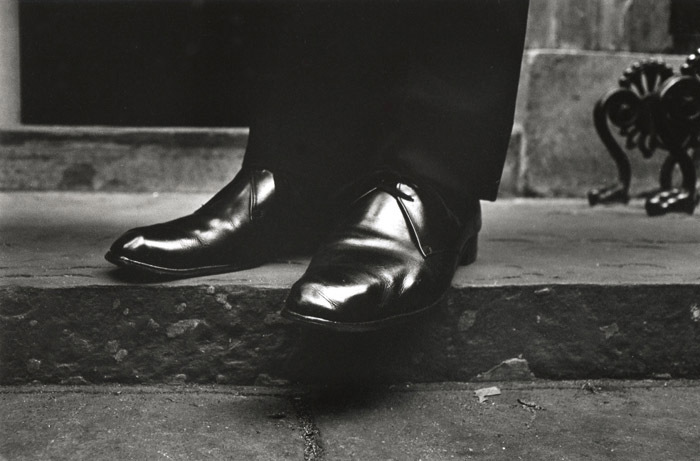 Your photographer, who was working on a shoe catalogue at the time, left the studio for Downing Street to make the second in a possible portfolio of prime ministers leaving their official residence for the last time. Finding Fleet Street there in force, he asked what was going on. He was told that Wilson had ducked out the back way and no one had got a shot, but Heath’s arrival was imminent. When Heath’s car drove up media crews formed a solid phalanx around him. Your photographer couldn’t get a look-in. All he was seeing was backs of heads. A clear aspect could only be achieved by lying flat on the ground and framing between the legs of the cameramen. Suddenly your photographer seemed to be back in his studio, shooting the shoe catalogue; the difference being that the shoes now confronting his lens were those being worn by a newly-elected head of government who for the first-ever time had his feet on the actual threshold of power and was making his victory speech live on national television. Next day a woman threw a tin of paint over Edward Heath at Downing Street and since then security has been too tight for exercises such as your photographer was twice lucky enough to perform. … for The London Column. © Angus Forbes 2011.